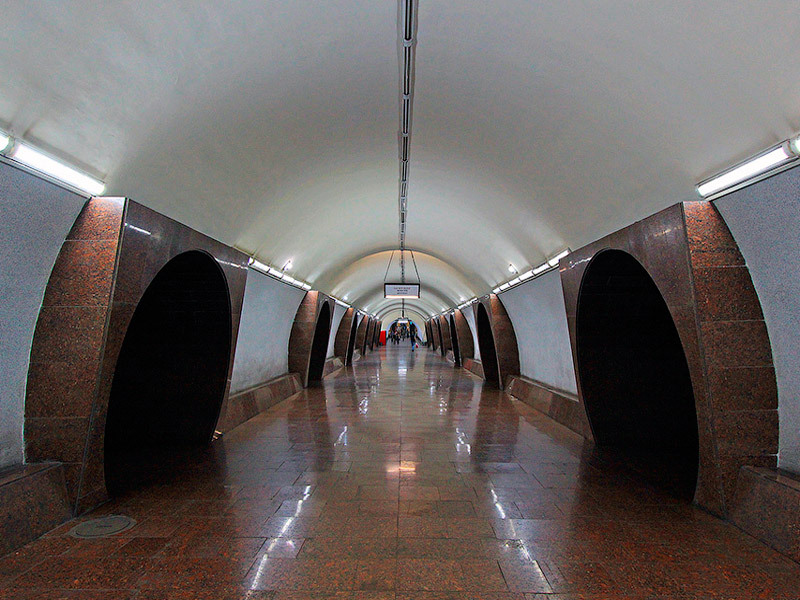 One of the symbols of Yerevan is the Metro after Karen Demirchyan. Not every city can afford the luxury of the metro. 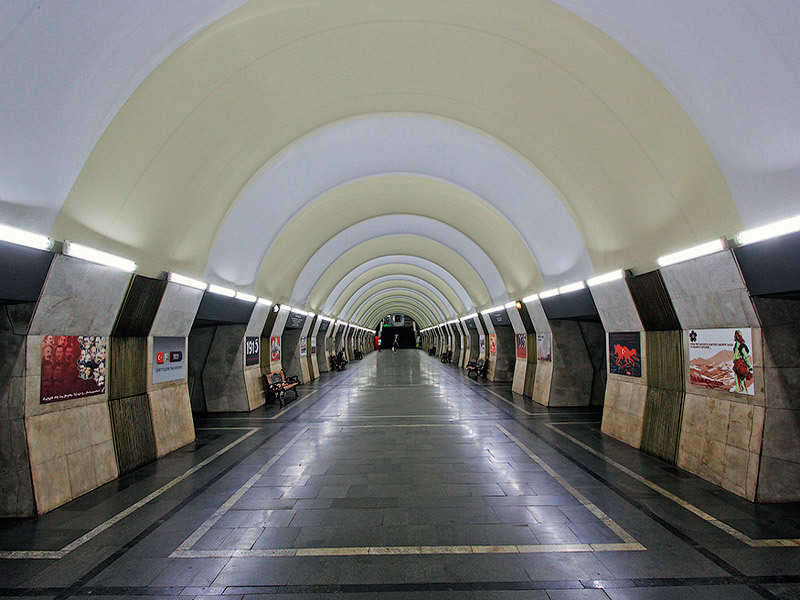 Nowadays in Yerevan, the underground operates with impressive engineering and architectural structure, which is surprising especially considering such a complex subsurface of the city. Metro is also an important industrial and economic value that needs to be preserved, developed and transmitted to future generations. Today, Armenia is proud to state that Yerevan Metro is one of the cleanest in the world. 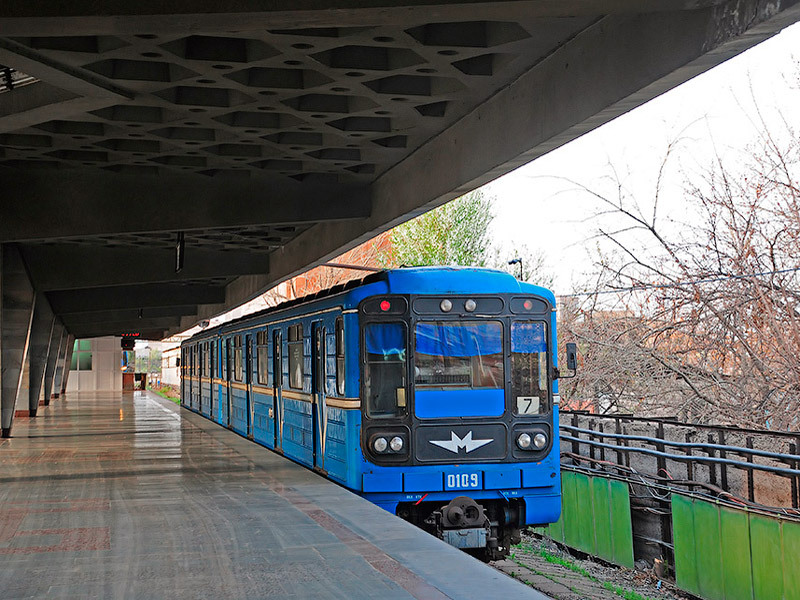 Arara offers a brief outline of the Yerevan metro and nearby attractions. This year Yerevan Metro after Karen Demirchyan has turned 35 years old. 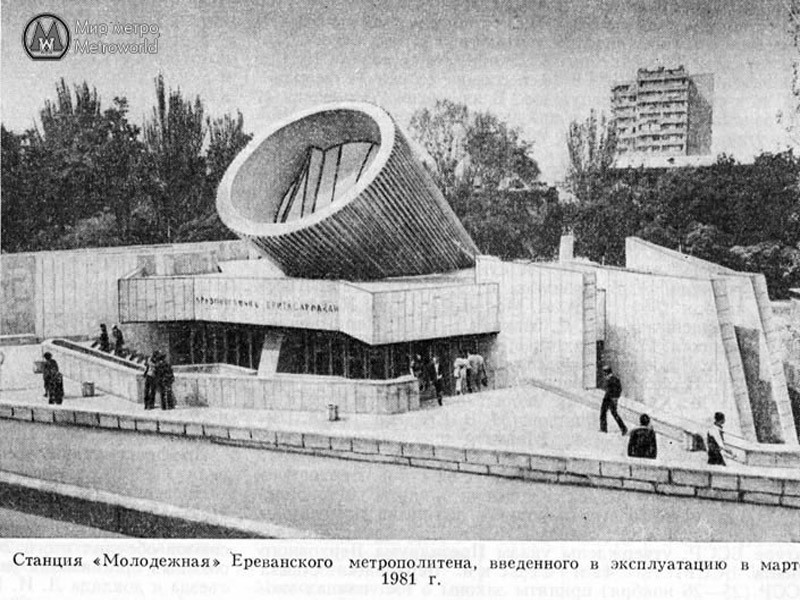 The grand opening of the metro took place on March 7, 1981. On this memorable day five stations, which operate to this day were first launched: “Barekamutyun”, “Marshal Baghramyan”, “Yeritasardakan”, “Republic Square”, “Sasuntsi David.” Later, from 1983 -1997 the existing 5 stations were gradually complemented by five more: “Gortsaranain”,”Shengavit”,”Garegin Nzhdeh “Zoravar Andranik” and “Charbakh”. 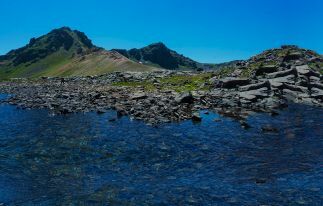 Armenia is very proud of its underground, because even after the collapse of the Soviet Union and during the severe 1990’s it has not stopped its work, despite the martial law and severe economic crisis. Since then, much has changed: the infrastructure has been improved and upgraded and new trains have been put into circulation, and now preliminary plans and estimates for the construction of new stations are being discussed. Currently Yerevan metro consists of 10 stations which extend by a single line of 12 km. 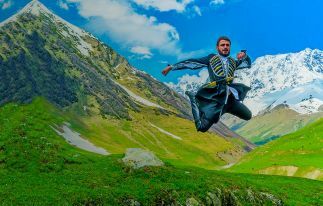 They have only one branch at the station of “Charbakh”, which is the end point and is located on the outskirts of the city. This makes the use of the Yerevan metro extremely easy and simple from the very first time! The main subway line connecting the greater center with inner city starts from the station of “Sasuntsi David”, which is also the main railway station in Yerevan. The Metro begins its work from 06:30 am to 23:00 pm. Small orange plastic tokens can be purchased at the box offices at the entrance to the stations; one token cost is 100 drams (about 20 cents). You can also purchase at the checkout plastic cards, which can be replenished as needed. 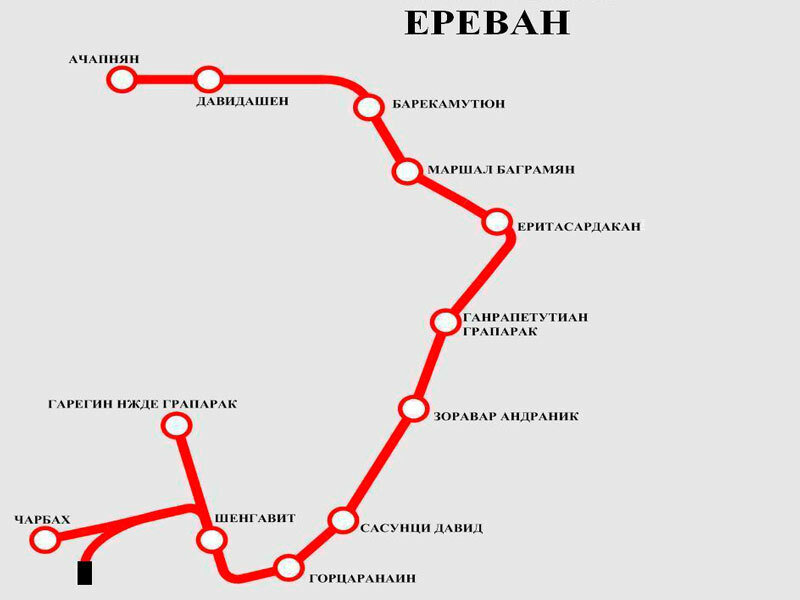 Information about train routes is available in the form of tables indicating the directions in 3 languages (English, Russian, Armenian), plus the speaker is directly notifying the name of each station in 3 languages. The path from one station to another is less than 5 minutes, and that’s why residents and visitors prefer subway because of the speed and the lack of traffic jams. And as a bonus, on the territory of the subway, there is free Wi-Fi. 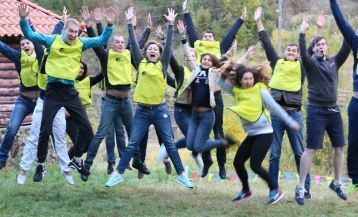 Yerevan is a relatively small, cozy town, and we believe that for the guests and tourists it will be useful to learn about the sights, which are located within walking distance from the central metro stations, so that they can better plan their route and save time. 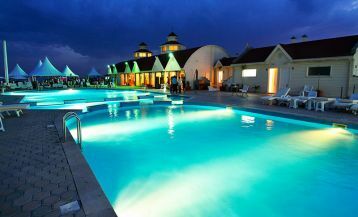 Below, we offer to get acquainted with each station individually. “Barekamutyun” (Friendship) – this is the final stop, which takes you to the Komitas avenue and its surroundings. The station of “Barekamutyun” has several entrances and is like a little underground shopping center, which was built in the form of a circle. Tsitsernakaberd, the memorial to the victims of the Armenian Genocide, as well as the Sport and Concert Complex after Karen Demirchyan (or Hamalir as locals say) are within walking distance from the “Barekamutyun” station. “Marshal Baghramyan” station is located next to the Parliament and the residence of the President of the Republic of Armenia. On the opposite side of the road are the buildings of AUA (American University of Armenia), the Academy of Sciences, a little further – the house of the Union of Writers and other administrative buildings. The station of “Marshal Baghramyan” is located in the heart of the city and the main tourist destinations – the Opera and the Cascade are within short walking distance. Directly next to the station is the most romantic city park in the English style – the “Lovers’ Park”. “Yeritasardakan” (Youth) is the busiest and congested station because it is in close proximity to major educational institutions of the city. The name which translated from Armenian means “Youth” already tells for itself: the station is seething with life. At the exit of the underpass is a monument to the great Armenian poet A. Isahakyan. A little further there is another sculpture – two intertwined hands, carved in white marble. 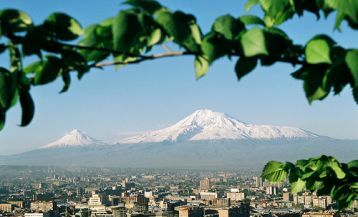 The sculpture was handed to Yerevan as a gift from its city sister Carrara, Italy. The station of “Yeritasardakan” due to its location on the main streets, is one of the most convenient ones. Here, within walking distance are located the majority of restaurants, cafes, and shops. In 2015, the underground passage was turned into a shopping center with a consonant name “Metronome”. Here you can find many shops, cafes, and even a free cinema hall! The “Matenadaran” – the repository of ancient manuscripts, the Cascade and Opera House are just a 10-minute walk from the station. “Hanrapetutyan Hraparak” (the Republic Square) is located in the heart of the capital, right next to the Republic Square, on Nalbandyan Street, a few steps from the famous market of Vernissage, where the best specimens and works of Armenian craftsmen are collected. 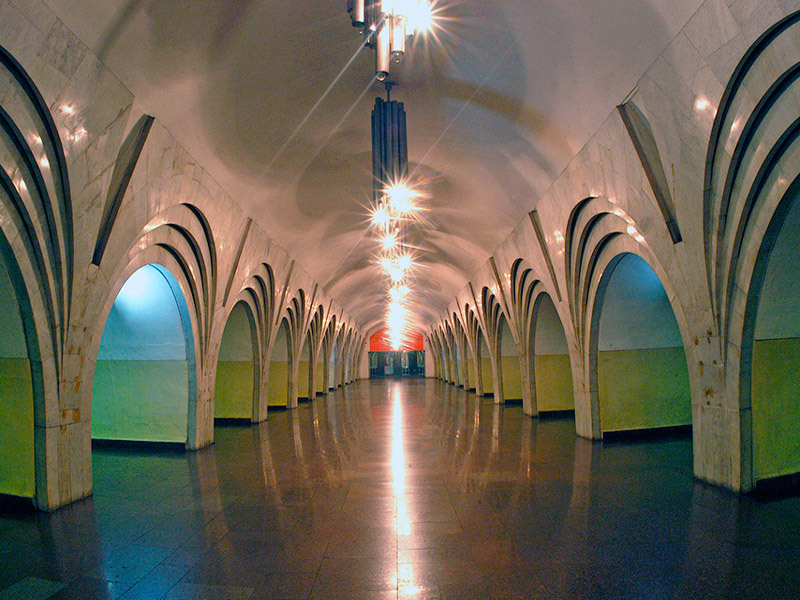 The station of “Republic Square” has interesting architectural ideas with various arches and vaults. At the entrance to the subway is built a beautiful fountain, whose jets freshen the air in the summer and give it a festive look! On the Republic Square are situated the Museum of the History of Armenia, the Armenian National Gallery, beloved singing fountains, and of course, lots of boutiques, cafes, and restaurants. On the territory of the Republic Square, there is a free Wi-Fi. 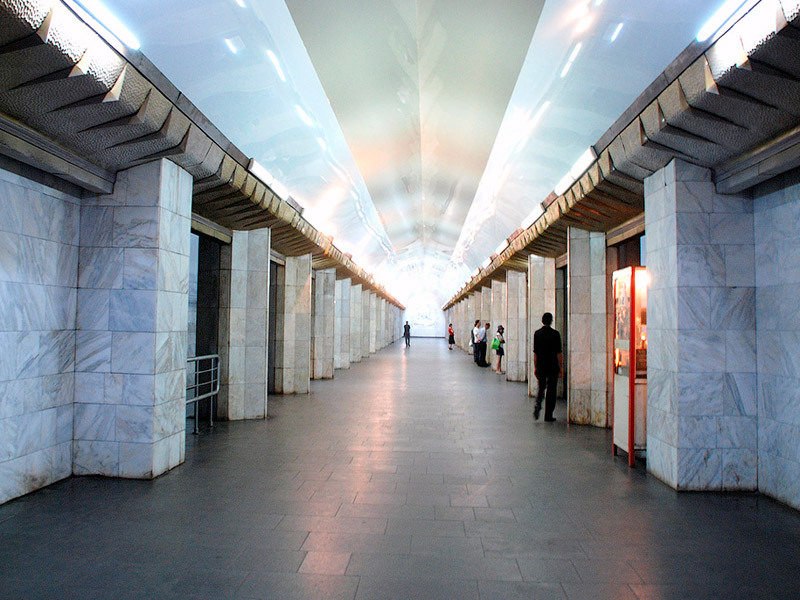 “Zoravar Andranik” station is located on Tigran Mets Avenue. Next to the station once was a large cinema “Russia”, which later during the 1990’s was turned into a market. In 2016 part of the market was rebuilt into a modern shopping and entertainment center called “Russia Mall”, the entrance to which is right from the underground. On the opposite street from the station is situated the Cathedral of St. Gregory the Illuminator. The Cathedral of white marble is a fine example of modern Armenian architecture, towering like a white bird over the city. Opposite the cathedral, there is a children’s amusement park “Lunapark” and a monument to the great Armenian military leader Andranik Zoravar, in whose honor was named the station. “Sasuntsi David” station is named in honor of the Armenian epic hero. In front of the railway station is the huge monument to Sasuntsi David – a handsome young man on a horse who embodies the freedom-loving spirit of the Armenian people – the creation of the famous Armenian sculptor Yervand Kochar. Yerevan Central Station is located directly above the subway station. Railway communication is open only with Georgia.